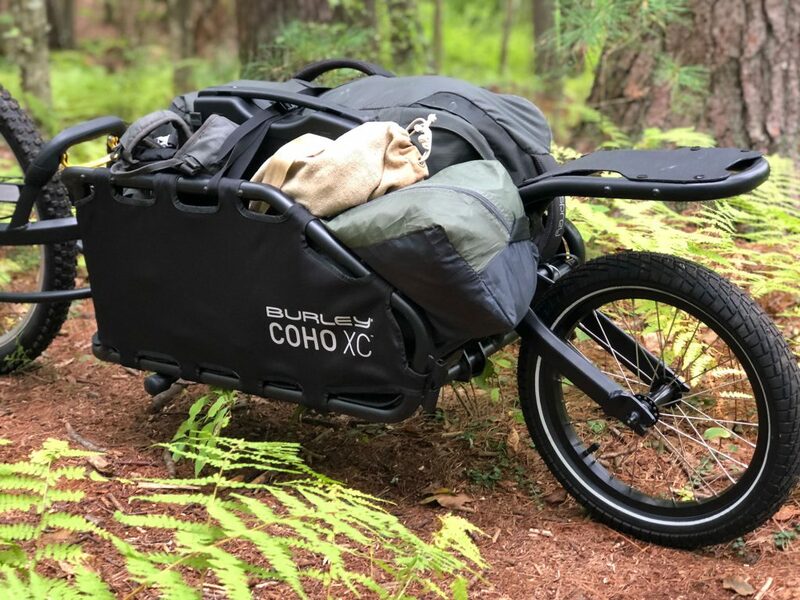 This fall I was able to test the Burley COHO XC trailer– a light, but robustly built mono-wheel trailer weighing in at 21 lbs equipped with its own suspension and designed to carry up to 70 lbs of gear over rocks, roots, and hills. It has a tool-free assembly, making it an ideal single wheel cargo trailer for a smooth ride on rough terrain. 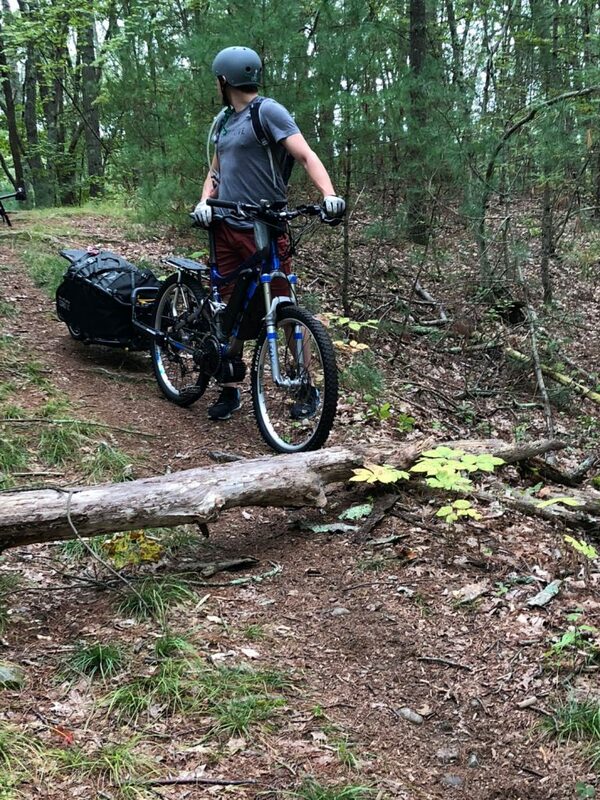 I decided to test this trailer on the heavily forested, flowy singletrack trails of Willowdale State Forest. Normally, getting to dispersed campsites would require a lot more time to backpack on foot, and leaving unessential gear behind due to weight or capacity. 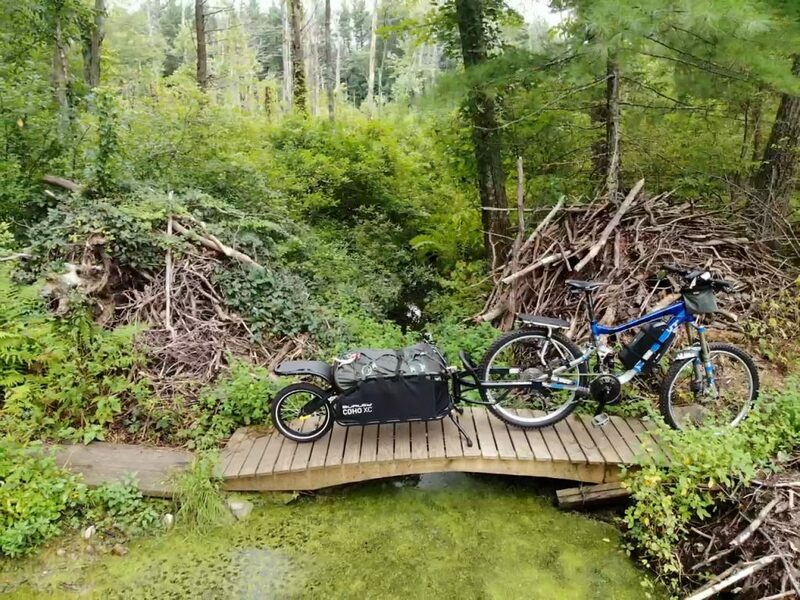 I found that loading gear into the COHO XC, and hauling it behind my bike, I was able to not only bring more non-essentials (like a camera tripod and a drone), but get farther faster, and spend more time exploring remote areas. The first step is assembling the trailer, which comes in a single box and took about 10 minutes to assemble. 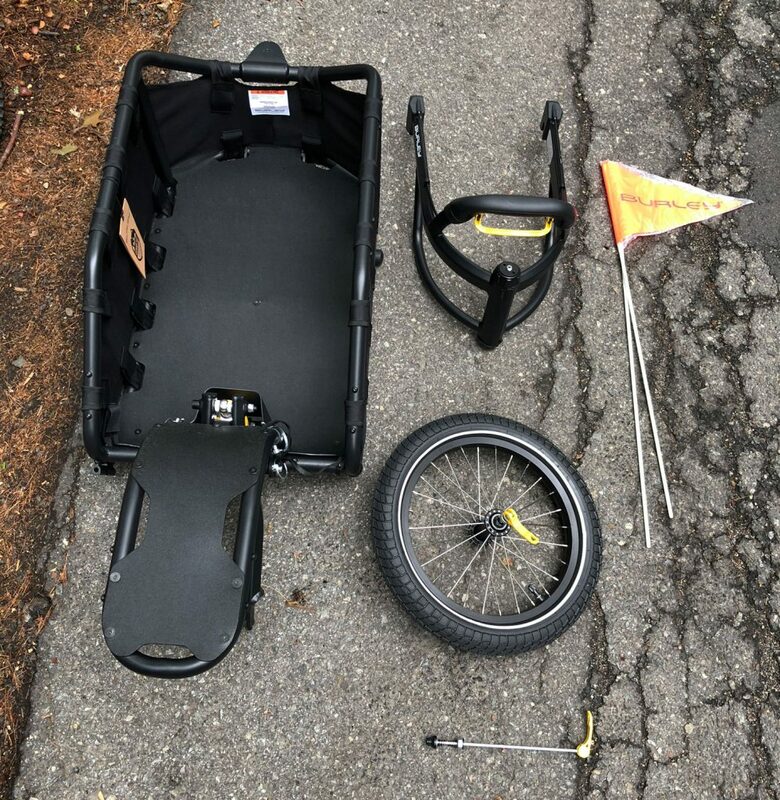 It comes with the Burley bike axle, rear trailer tire and axle, swing arm, rear fender, cargo net, front bike connector, locking pins, flag and rear reflector. It was quick and easy to set up with very clear instructions. The cargo area is pretty spacious at just shy of 16 inches wide, 24 inches long, and 11 inches tall. When you pack your cargo correctly (heavy stuff at the bottom) it fits quite a lot of gear. The cargo net also keeps everything snug and secure. The hitching system allows for quick and easy installation as well as removal from most bikes. There’s also a release handle that disconnects the locks with one hand, for an easy on and off. Probably one of the most convenient features of the trailer, being able to easily remove it to move over obstacles like fallen trees, or disconnect from your bike and connect to a friends’. The pivot joint shown above lends to the nimble movement and natural ride. The rider is aware of the weight, but it is not inhibiting maneuverability. Connecting the yoke to your bike was really easy, you just line up the Burley ballz locks at end of the axle with trailer arms extended, and they will self-engage and lock in place, which is pretty cool. No tools needed. The yoke also has an adjustable width, so it can be installed on a wide range of hub widths (126 – 197 mm), which is great if you have multiple bikes. For an easy one-handed release, lift the yellow lever at the front of the trailer, and it pops right off. All in all, assembly was quite easy, and in 10 minutes this trailer was ready to go. 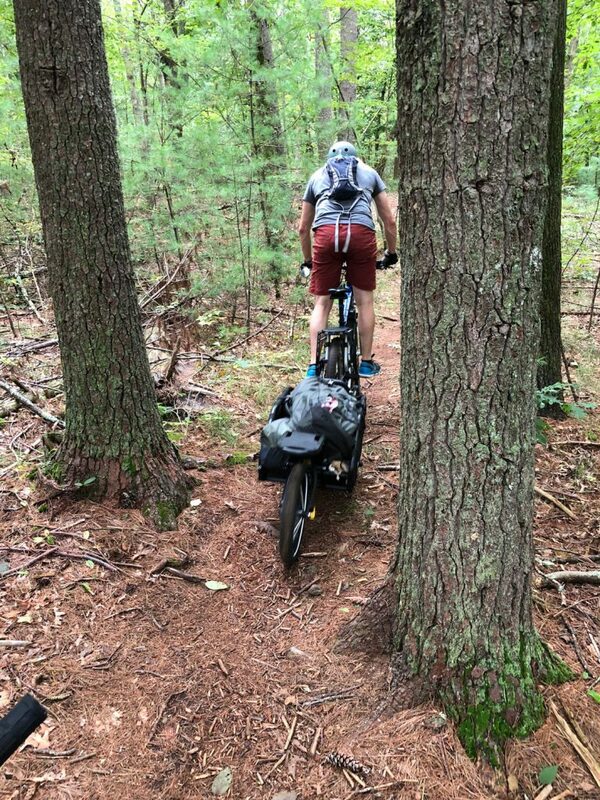 I took the Burley COHO XC out for a test ride on smooth and winding trails through New England forests. 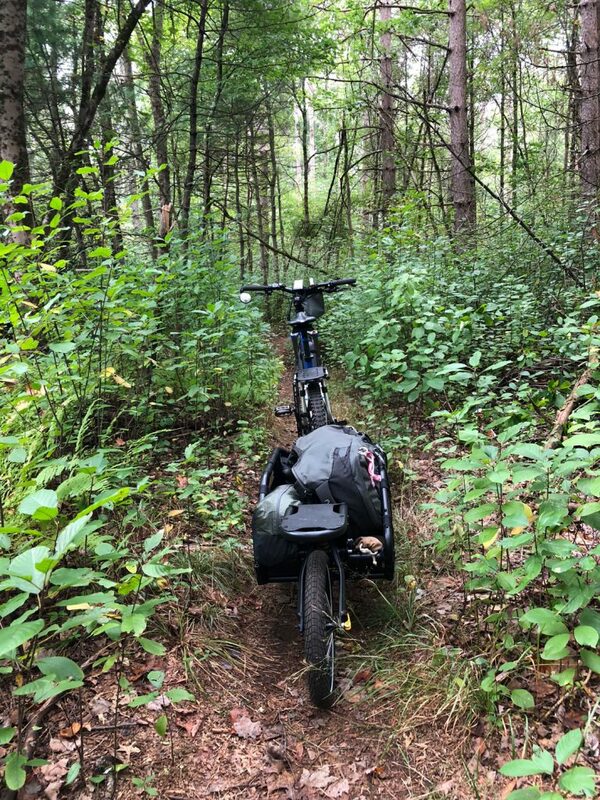 These types of trails were heavily forested single track, so it was imperative that the trailer tracked well behind the bike, especially at higher speeds, which I can definitely get to on my electric bike. I towed 52 lbs of gear behind a self-converted electric Giant Trance X3. The power of the electric motor helped to pull the extra weight up hills and test speed capabilities at approximately 20 mph going downhill. I found handling was ideal around 10-15 mph. I also tested the trailer without power and found the weight of the trailer was only noticeable going uphill. When riding on flats and downhill trails, the trailer handled spectacularly considering it was carrying over 50 lbs. I was very interested to see how the Coho XC handled rocks, roots, hills, and tight technical riding. On my first test ride, I was hauling 52 lbs of gear including the following: a camera tripod, drone, tent, Osprey 70 liter pack, bike tool box, and water. 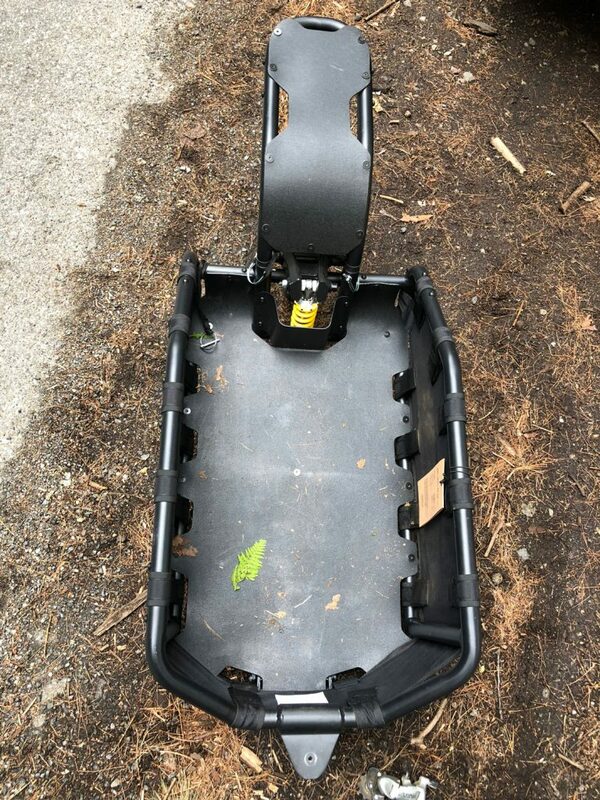 A mile into the ride, I needed to redistribute the weight so the heavier items were lining the bottom and the overall weight was below the walls of the trailer. This change dramatically improved the handling. The great part about the COHO is that it has really great clearance. Even on trails that have rocks and larger branches, I never worried about hitting anything thanks to its 7.5 inches of ground clearance. I also loved the adjustable kickstand, which holds the trailer and bike upright, making it much easier to adjust your gear or park to grab snacks or food during a rest. It’s excellent for carrying all sorts of things! One time, I decided to bring a pony keg along, just because, I love beer. The flag holder also doubles as a bottle opener, a pretty fun feature for the adventuring beer lovers out there. I spent a lot of time riding on packed in flowy singletrack of Willowdale State Forest. 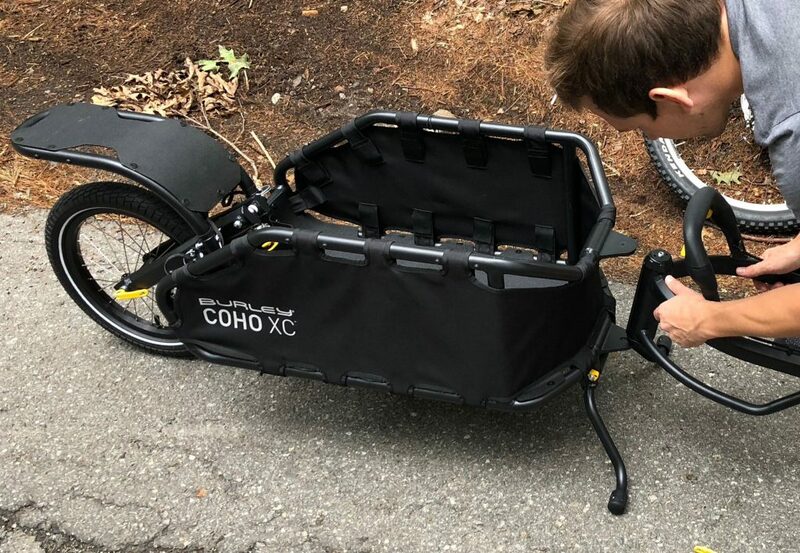 I found the COHO XC is extremely nimble and able to navigate tight turns and rough terrain due to the pivoting joint at its front and the mono-shock at its rear. Pulling the additional weight took some getting used to, but the ride was very smooth and the trailer carries the weight well. I took it down several steep rocky single tracks and even a small 1 ft drop (at slow speeds) without experiencing wobbles or loss of balance. I took a video to show just how great this handles on rougher terrain. Adding the cargo net on top, makes everything even more secure. I was amazed with how well it crawled over rocks and how the pivot joint allowed me to navigate tight trees. The suspension gives it a smooth ride and it didn’t feel like you are lugging the 50 lbs of gear I had loaded it up with. I never tried riding over logs with the trailer connected I found it easy enough to disconnect and walk over impassible obstacles and then reconnect. I also really liked how it tracks behind the bike (when the weight was properly loaded at the bottom). The trailer stayed under control and in line while going down steep descents, and along narrow ledges. The one wheel design gave excellent maneuverability without compromising stability or weight capacity. 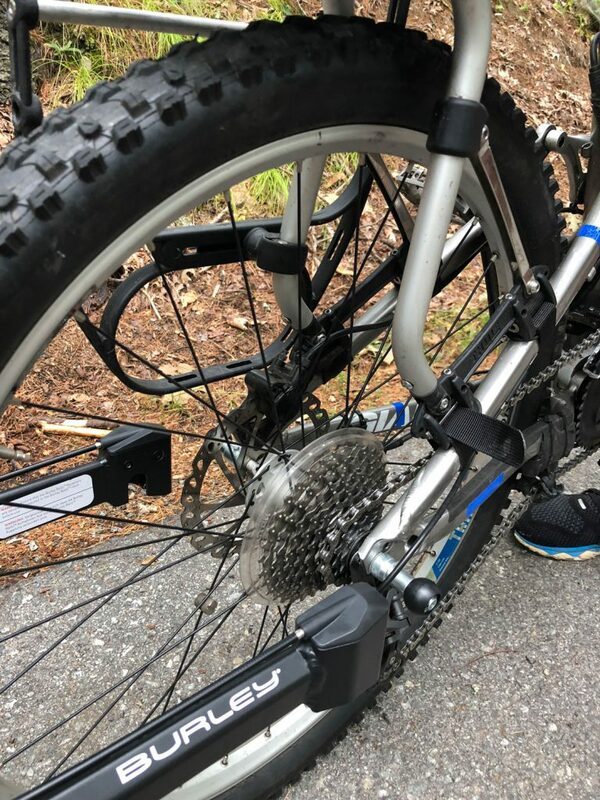 I tested 52 lbs at slow and fast speeds ranging from 2 – 20 mph, which was really fun to test out on higher speeds with my electric bike. You definitely want to take it slower when turning or on uneven roads, but ultimately it’s an extremely versatile trailer for all sorts of terrain. This trailer offers a lot of great features and was really awesome for hauling gear for overnight camping trips. The trailer and my electric bike allowed me to get farther into the backcountry then I would have on foot. Sometimes when disconnecting the trailer with a larger load, the quick release handle felt a bit loose. I’d give the COHO XC a solid five out of five stars. Ultimately, its a super versatile trailer that is ideal for hauling climbing gear, camping gear, or even pony kegs over rough trails and roads alike. At 21 lbs, it is lightweight for its capabilities, well made, and easy to transport even when fully assembled. 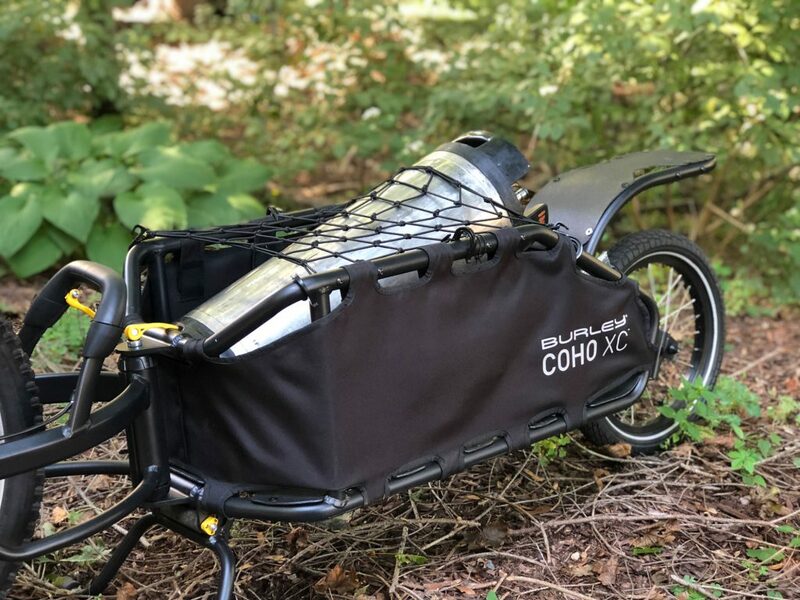 So if you’re looking for something to accompany you on that next outdoor bike adventure, take the Coho along and you’ll be able to cruise with any and all gear you might need. In fact, I had been looking for something to attach to my bike to haul climbing gear back to the crag, camping gear to dispersed campsites in the White Mountains of VT, and even something for bringing my home brewing equipment to and from friends’ houses — I found my ideal trailer in the COHO XC. 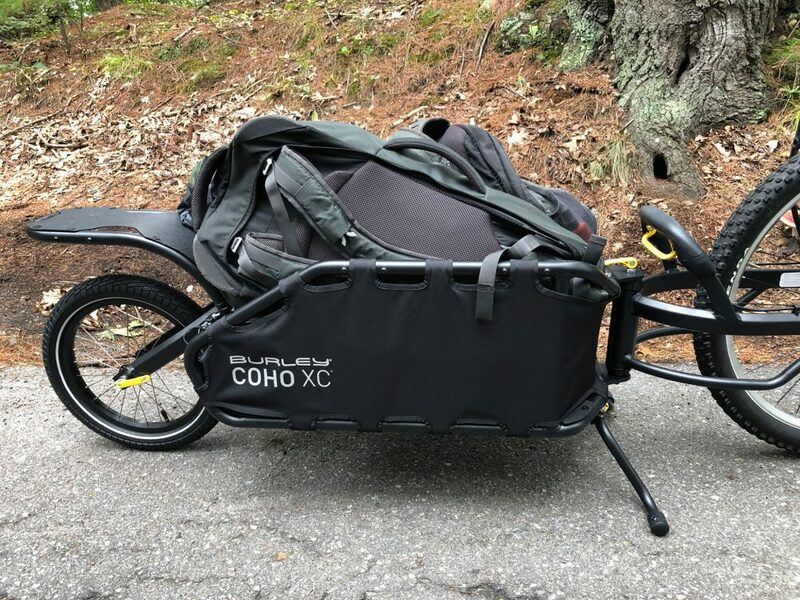 Shop the Burley COHO XC on Outdoor Prolink. Not a member? Apply today! Jonathan is a Colorado native born and raised in the Rockies. He grew up in Greeley, Colorado but spent the majority of his childhood hiking and skiing the Western slopes of the Rocky Mountains (Arapahoe Basin, Keystone, Vail) and riding bikes on the slick rock outside Moab, UT. He attended the University of Colorado at Boulder for his Undergraduate studies where he developed a love for climbing and backpacking and all things outdoors. Adventures were not contained to weekends as he would often embark on night hikes 4-5 nights a week after class. 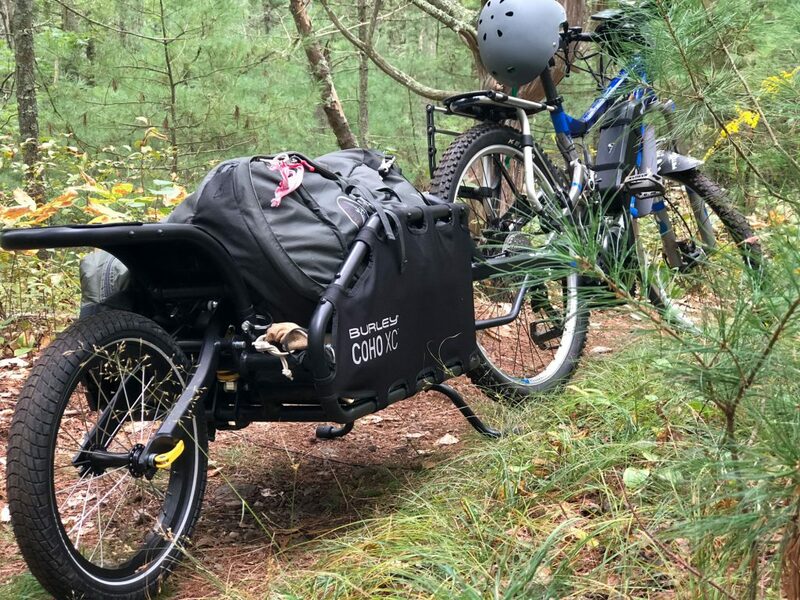 He enjoys hiking and exploring the forests of the East Coast on his self-converted electric mountain bike! He keeps an inflatable kayak in his trunk to explore the many waterways of East (just in case). Aventure is out there and Jonathan is determined to be the one to find it! It’s weird how you hide your face in all the photos. I like how you use it with your self-installed electric bike. Respect.